• To ensure a stable connection, don't use this hub with high power consumption devices (those exceeding a combined current of 4 Amps among all ports) such as some large-capacity hard drives. 10 of 10 people found the following review helpful. 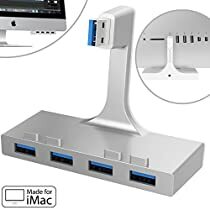 Bought this for my new MacBook Pro with USB 3.0 inputs. I've connected an external hard drive that I use for my Time Machine. Pleased with the performance so far. But, the hard drive isn't USB 3.0. However, I did transfer images from my SD card with this hub. Very fast indeed. To make sure everything everything works to order, I bought the Cateck DC 5V 2A/2000mah charger 3.5mm AC Power Adapter to insure that my peripherals receive enough power to stay connected. If I find that the hub malfunctions in any way, I'll be sure to update this review. 18 of 19 people found the following review helpful. Amazing Design, Works Extremely Well, I LOVE MINE! -A PERFECT design (my opinion)! 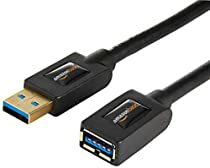 -Supports USB 3.0 for a fast transfer speed. -SD and Micro SD card slots is really nice and works well! -Power output is on my back for a clean design to hide the cable. -A full rubber mat on the bottom to help it stay in place and not scratch your desk. -It's constructed out of plastic but it feels good and looks really nice. -Supports two power sources to accommodate more higher power devices. -It has built in protection. I would definitely recommend this product. Looks great and is very much practical. Does exactly what you want it too! 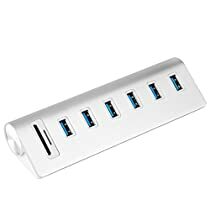 This device is a solid option for anyone looking for a nice looking USB 3.0 hub. It attains a similar look to apple products and will look good in almost any setup. The 3 USB ports and card reader are convenient for my setup so I don't have to reach around to my computer and hook up more stuff and it also adds additional USB ports and a card reader. It has been working good for me with no issues. Seems of solid construction with a pad at the bottom to make it stay without moving around. Also has over voltage protection which is always a nice feature to have. After running some tests with an SSD plugged into the hub I was getting really good speeds upwards of 525MB/s which was the same as it being hooked directly to the motherboard. I just plugged it into my PC and it worked right away. only issue I had was that the cable was a little to short to hook up from back of PC to front of desk but it's still of decent length. Pleased with it so far and it seems like a good product.